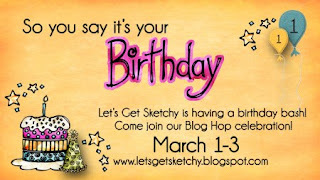 Let’s Get Sketchy is turning ONE and to celebrate we are having a Birthday Bash Blog hop. As you make your way along our hop to visit each of our DT blogs you will find lots of birthday inspired projects. If you have arrived here from Laurie's Blog welcome to the LGS blog hop!! 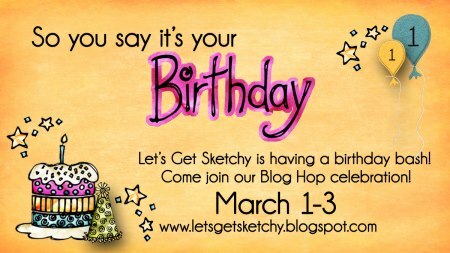 If you have stumbled across this by chance and want to play along then you can head back to the Let's Get Sketchy site to start at the beginning and to start collecting your Birthday challenge words. These words should be bolded on each DT member’s pages. Birthday Bash Challenge- To create any birthday inspired project from an example you see on any one of the DT pages and upload at LGS. If the DT project is a layout then do a lift of that page, if it’s a project of sorts then do that project. You can pick from ANY DT member’s blog project for the hop. The winner of the hop will be randomly selected and will win a nice bag of scrap goodies from Lets Get Sketchy. As always there are rules for playing! Also as you hop along the way you will find clue words on each of the Design Team member’s blogs. Once you have gathered all the words they will form a quote related to our Birthday. Tell us that quote by emailing letsgetsketchygmail.com and get your name in the pot for an extra drawing. MY CLUE WORD is "YOU". 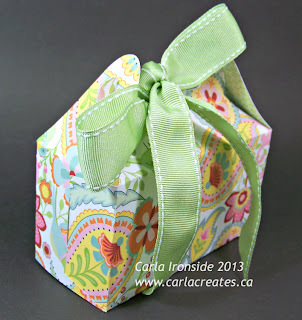 My birthday project for you today is a card and matching gift box. Project features CTMH Chantilly paper, Shimmer Trim, Card Chatter stamp set, Sweet Leaf Stitched Grosgrain Ribbon, Paradise Bakers Twine, Red/Pink Button Assortment. Flowers and Gift Box were cut with the CTMH Artiste Cricut cartridge. As a bonus -- I will also be randomly drawing from all the commenters here on this post to give away a CTMH Birthday Card kit! Good luck!!! Now hop on over to MICHELLE's BLOG to see what she has in store for you! What cute projects Carla. I love all the bright colors! So cute, I love all the colors! Love, love your card and gift box! Excellent job Carla! They are gorgeous! Love the colors and that big flower on the card is cool. Thanks for sharing. I'm a new follower. Super cute box and card. Love the flower paper. Great birthday projects Carla! Love the box! Darling projects! Love the card design...so unique! I love the Chantilly line! 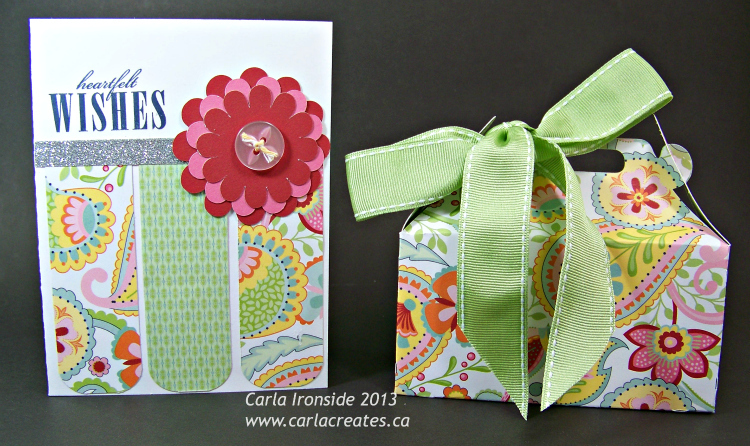 Your card and box turned out so wonderful and full of sweet spring colors! TFS! The box looks so perfect! your projects are wonderful. Wow! What an amazing present Carla. I have loved serving on the DT with you. 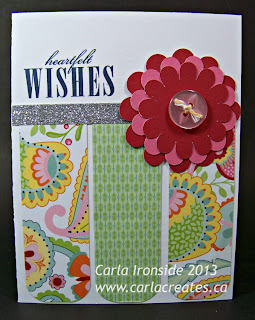 Thanks for the inspiration Carla!!! I was able to make my Father's birthday card using ideas from your card layout!!! !